Any time a book has "life-changing" in the title, it warrants the side-eye from me. Yet, I kept hearing from so people that Marie Kondo's book The Life-changing Magic of Tidying Up would indeed change my life, so I had to give it read. 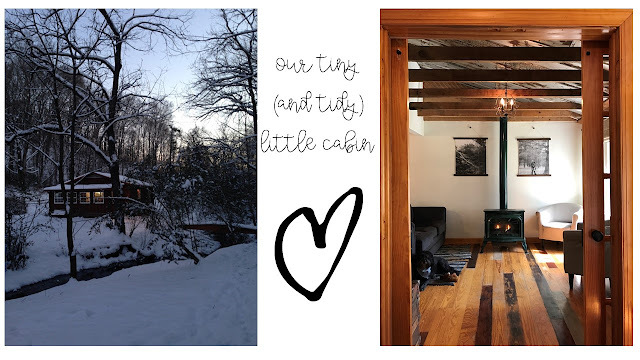 That was three years, financial freedom, a half-size house, and an online teaching and traveling sabbatical ago. So yeah, I would definitely say that this book changed my life. 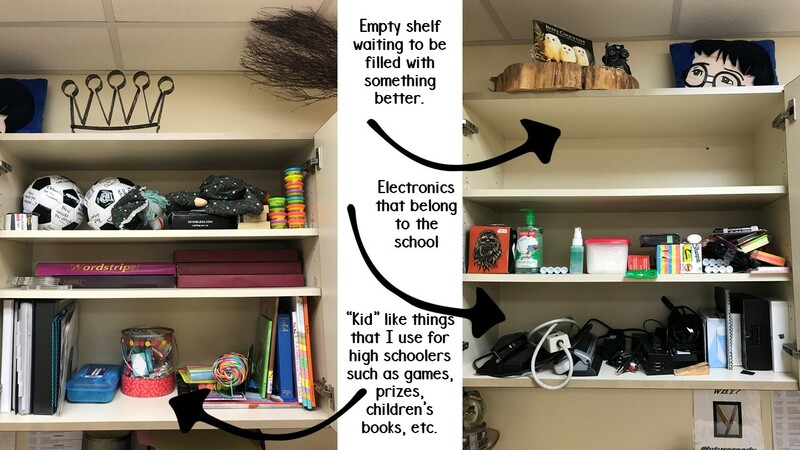 I worked a little on decluttering and cleaning every day (by little I mean trash cans FULL for two weeks straight), and I can already feel the difference it's making in my classroom as it did in my home. Our next challenge will begin in May 2019! 1. Declutter. 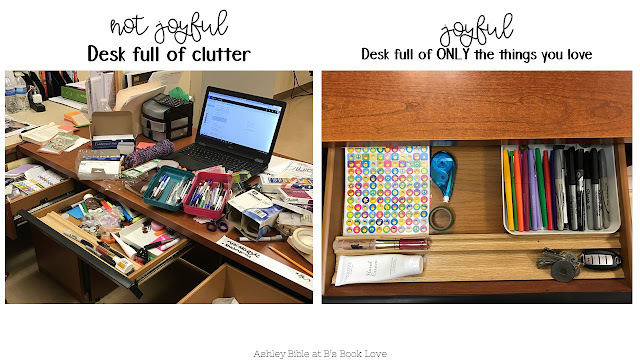 I believe that teachers are natural hoarders, and I was no exception. I've tried decluttering in the past, but mental blocks always held me back. "What if I need this one day?" "I could make so and so craft with this!" "This cost too much money to throw away!" and so forth. This is where The Life-changing Magic of Tidying Up excels. The way Kondo explains how the Japanese view objects really hit home for me and allowed me to rewrite the narrative I told myself when trying to declutter. *Start with nonsentimental items. Don't go straight for student projects, notes, awards, or books. You have to build up your decluttering muscles before tackling sentimental items. *Do one cabinet or drawer at a time. Take EVERYTHING out. This part is very important. 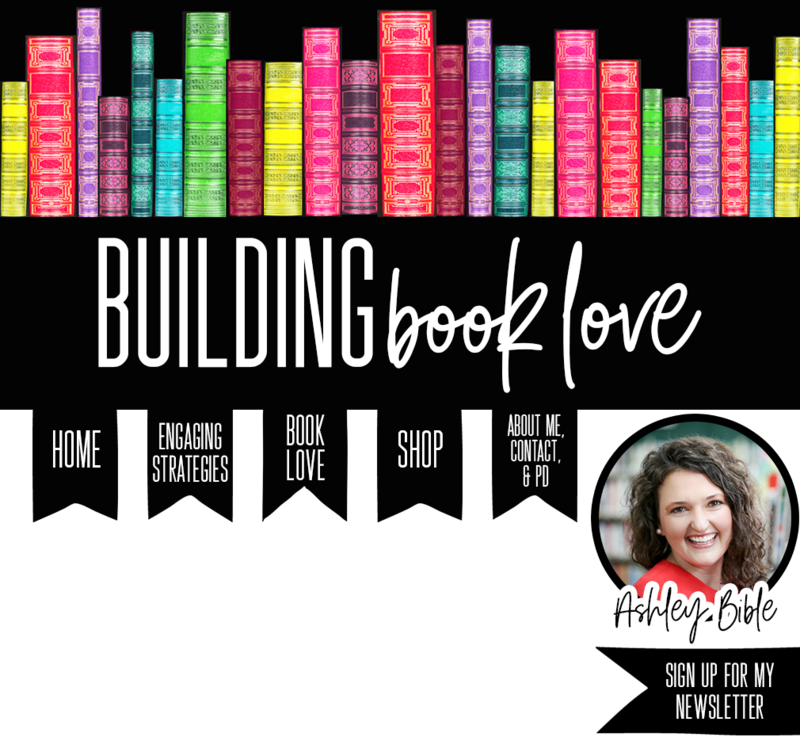 Your mind will see a clean slate and will automatically not want to clutter it back up by filling it with junk (This is also how I've saved so much money since reading this book; I think long and hard before buying anything now). *Declutter as much as possible. As Kondo explains in the book, our need to tidy will continue as long as we allow clutter to live in our lives. It's impossible to keep mountains and mountains of items organized day in and day out. The less you have, the tidier your room will be. *When dealing with paper items, discard almost everything. If you are in a paperless classroom, then you are well on your way to achieving this lofty goal! While I grade essays fast and effectively online and use Canvas for assignments, I'm still giving my tests on paper. 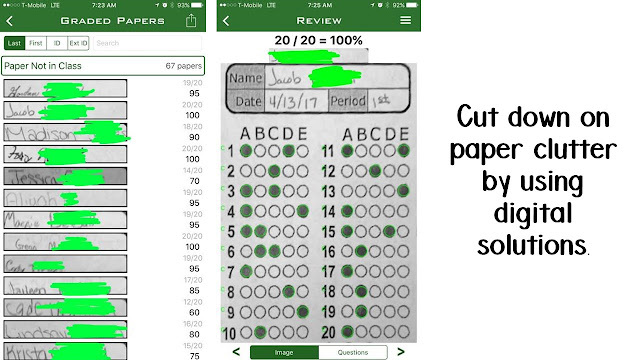 However, one thing I love about using ZipGrade to grade paper tests is that it scans tests and keeps the "copy" in the app and in the cloud. Therefore, I can scan tests and throw them out right away. *Get students involved. 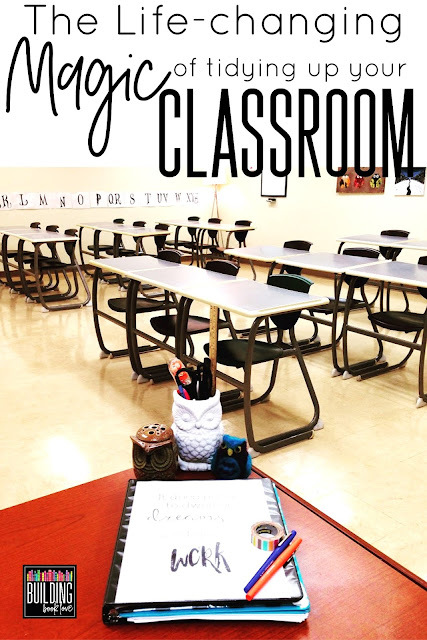 Cleaning, decluttering, and getting rid of papers in your classroom is a HUGE undertaking, and you shouldn't have to go at it alone. Here is a little freebie I created that both you and your students will love. 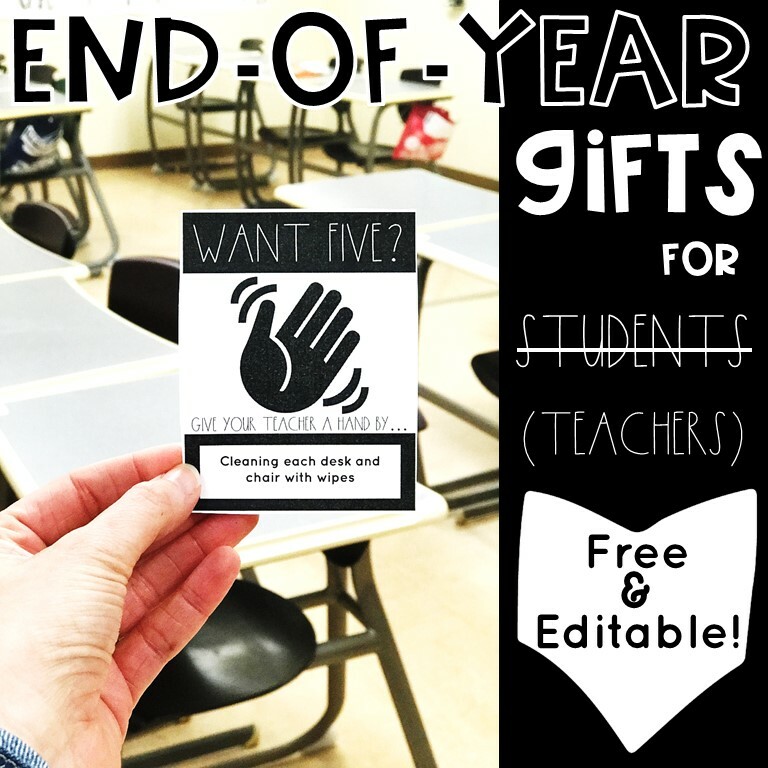 It says end-of-year, but it can be used any time the cleaning bug hits you! 2. Keep Joy You will need to read the book to get the full explanation of how to be in tune with joyful items, but for most things, this will be obvious. *Throw away, donate or recycle all of the things that do not bring you joy (the book reiterates this constantly). *Do not transfer your discarded junk onto others. Whenever you ask someone if they would like something you want to discard, they feel obliged to take it. It might make you feel better to believe that it will be used, but all you are doing is transferring the burden of an object onto someone else. Instead, put a box outside of your classroom door and send a picture of it to the staff. Tell them that you plan on donating it this evening so come get anything you want before it's gone. If teachers are truly in need of the items, they will make the trip to your room after work. 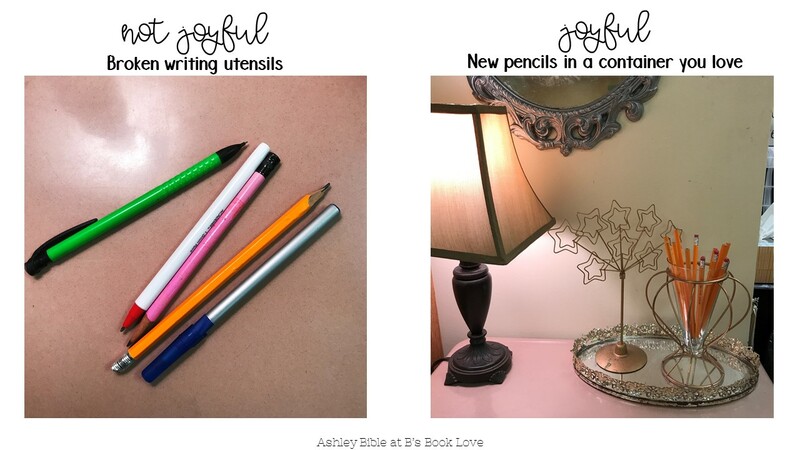 *Once you make it to the sentimental items in your room, consider how each item is best honored. If it's truly something precious to you, how should you display it so that it gets the recognition it deserves? 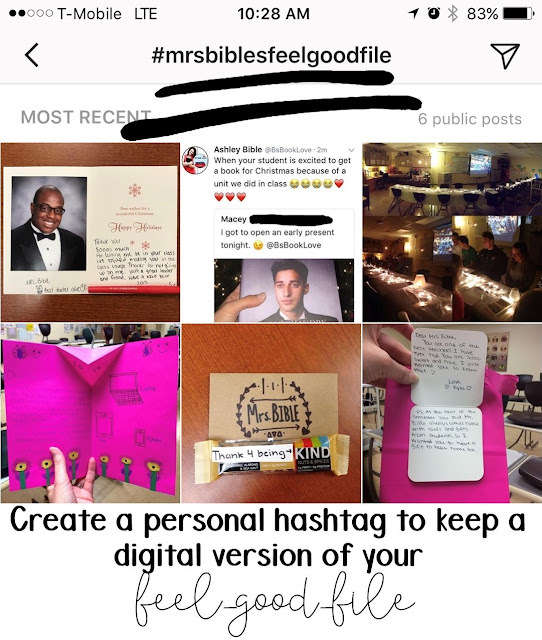 Most have heard of the tip to create a feel-good-file for your most thoughtful student notes. However, to take this a step further, I've started taking pictures of these notes (hiding the student's name) and tagging them with a personal hashtag. That way, I can search this hashtag any time I feel like reminiscing. 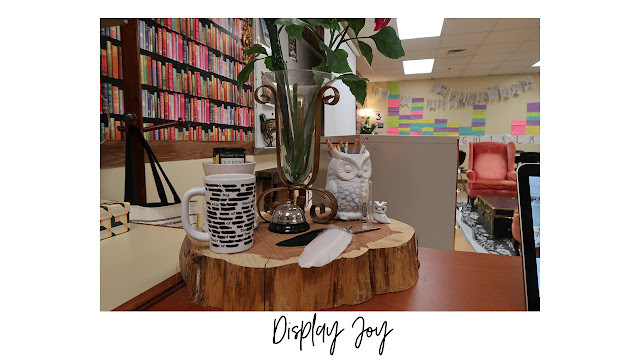 *Add things in your classroom that make it a more joyful place to be. So far, this post has leaned heavily on getting rid of things in your classroom, but it's also acceptable to add things in that bring you and your students joy. Actually, that is the entire point of the book. You should get rid of things that are weighing you down, causing you guilt, or hindering your best self so that you can highlight and appreciate the things that bring you joy. For me, this is my Harry Potter decorations. This little spot on my desk brings me so much joy! 3. Organize by Use- Once you have decluttered, it's time to put things back in an orderly way. I personally didn't buy expensive organizing containers to do this because all of my stuff is hidden behind a cabinet. Although, Kondo advises not to be frugal with things if they truly bring you happiness, so if pretty containers are your thing, go for it! I simply grouped things according to their use. You can see in the pictures that I have plenty of open spaces which are waiting for my year-long replacement teacher to use for his or her liking (Not going to lie, I'm feeling super territorial over my room, but I want my students to have an amazing teacher for next year, so I need to leave room for that in my heart ...and shelves). 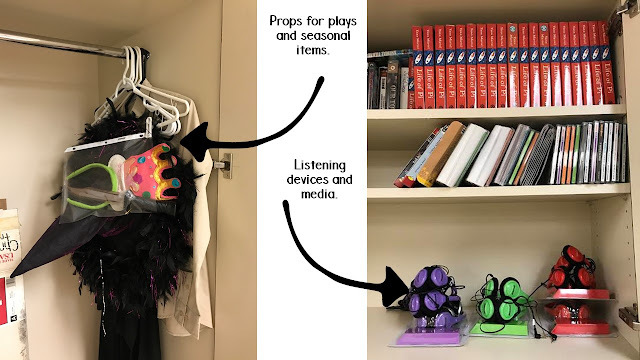 As you can see, my room is far from minimalistic, but the things that are left in here are useful and bring myself or my students joy. Clean classrooms are happy classrooms!!! I am loving the "Keep Joy" mantra! Awesome post! I'm going to check this book out! I loved that book! It's helping me so much on my minimalism journey- I'm not sure if I want true minimalism - but definitely clutter free. I love the Keep Joy. I have some decluttering to do as I write this! Thanks for the inspiration! I’m a very down-to-earth person, but it is my job to make that earth more pleasant. Good share. 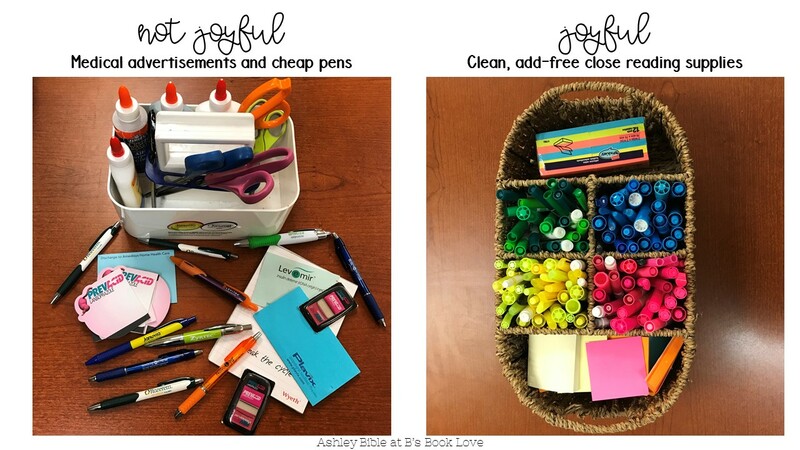 When you created your digital "feel good file," did you throw out the actual items to get rid of clutter? Great question! If they are small items that are very meaningful, I keep them and put them in a real file. If they are larger items that I'm only keeping out of guilt rather than joy, I throw them away. I'm moving classrooms for next year. I've been pulling my hair about "recreating" my current room (which has a perfect layout IMO) in the new room. My husband actually uttered those words today, "Maybe you just need to ditch some of your treasures!" EYE OPENING! Are the Harry Potter posters available in your TpT store? I LOVE them (& all things HP)! Nowadays, security is need of each home and no one is secure in this world. I figure everybody should present a camera in their home. Here read more in this blog, you analyze the night vision camera which is so awesome and working so well at night. Wonderful blog post, I basically esteem this man who develops the unique kind of electronic instrument. I never got some answers concerning this instrument yet this man did the surprising action. I am sure this this website will pick up the considerable recognition. Your occupation should be your internal sidekick since you have to improve it and you gain with the help of this friend. This www.sopformat.com/format-of-business-school-statement-of-purpose/ site is so amazing and researchers are so virtuoso since they dissect and condition.